Why Weaver's Revenge? Conputers have offered a rare oppertuniity for craft in modern commerce. This seems to be changing. If you are reasearching weavers, please see: wikipedia on weavers. Marpa was just an ordinary person, involved in living every detail of his life. He never tried to be someone special. When he lost his temper, he just lost it and beat people. He just did it. He never acted or pretended. Religious fanatics, on the other hand, are always trying to live up to some model of how it all is supposed to be. They try to win people over by coming on very strong and frantic, as though they were completely pure and good. But I think that attempting to prove you are good indicates fear of some kind. Marpa, however had nothing to prove. He was just a very sane and ordinary solid citizen, and a very enlightened person at the same time. In fact, he is the father of the whole Kagyu lineage. All the teachings we are studying and practicing spring from him. 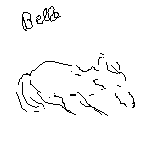 This is a drawing of dog, Belle, that I made on my Palm Pilot. My final thought is to encourage people, especially young people, to listen to their brain when it comes to things that interest them. Don't be afraid to dig around and try to learn about things that snag your attention. That feeling you get when you wish you understood something, a kind of yearning, is your brain's way of telling you that it thinks the knowledge might be useful later. If you listen to it enough, you stand a good chance of knowing the right thing at the right time to make some small difference.